Coal Burning stove noob makes fire,,,coal stove first fire. This hand fired sears automatic coal burning stove was still burning 20lbs of anthracite nut coal after 19 hours. The sears automatic is an antique coal stove made in the early 1900's meant to be a "chick brooder". That is, a chicken coop heater, with automatic damper controls. Purchased to be an alternative to fuel oil and a duel fuel home heating stove, learning of its intended use was a bit of a set back to my "chp" combined heat and power project. The little coal stove did have a top feed opening about 6" round, that allowed me to use the stove in this test for my other home heating project, a "hot air fan". Being experienced with wood burning stoves, and the work involved with all aspects of its use, I look to coal as a supplemental addition to a solid fuel home heater. Needing, electricity, and the possibility of broken and expensive electronic controls, at an in-opportune time turned me away from pellet stoves. Firing an air tight wood stove, for many a cold season, the fact remains that the fire must be stoked just before bed time, and the very first thing in the morning, usually before I've had coffee. Neither of these lending itself to what i call ease of use for a good sleep pattern. The heat out put of an air tight wood stove is hot when its hot and not when its not. This constant up down heating cycle, when trying to heat the house with a wood only stove just doesn't work when you are the single fireman. It is hard to do anything else, if you have to feed the stove, every 3 to 6 hours. While most are turning the dial on the oil burner, this turns into a near full time job. Being an antique stove, I thought pertinent to learn firing the coal stove outdoors for the first time. Starting the coal fire in the traditional way, with small kindling wood, then slowly adding nut coal on top until i had about 20lbs of anthracite coal into the stove. Amazing to me that these black rocks of anthracite burn, and burn well. After 19 hours the little stove was still burning, no smoke, little ash, and still a near 400F degree fire box temperature, GREAT. At this point i knew I would have next to none, if any fire left in my wood burner, as the fully loaded stove, complete with the famous "all nighter" stick, would have been reduced to embers, that would barely light a sheet of news paper with out help. The notion that 15 to 20lbs of coal doing the same job as 100lbs of cord wood is astounding. Know wonder that the peak of coal stove use, 100 years ago, the stoves were built with care, to last, and be a center piece of the home. 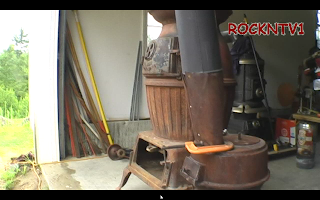 While the coal burning heater in this video will never be in my house I have learned much about hand fired coal burners. My pot belly stove will get basement duty as a house heater, not because its ugly, its a cannon stove heater, but because the floor plan does not center on or around the stove, as so many did. In a world full of smaartmeaters and idiots, may be the next house I build will center around an antique parlor base burner coal heater, nickel plated with 360 degree mica windows, a hot water maker and a bread oven, so i can turn them all off.